Handmade items may vary slightly in size. "Sometimes you just gotta put on your tutu and twirl away." Because there's nothing a tutu can't fix. Made from only the highest quality and craftsmanship, this darling pink charm will set her feet dancing. Murano Glass beads are hand made in Italy by skilled artisans, whose expertise and attention to detail makes each and every bead a work of art. The alternating opaque pink and transparent glass gives this gorgeous charm depth, allowing the sheen pink layer underneath to shine through--Just as the light inside of your little princess shines through when she dances! Murano Glass charms are hand made, sizes will vary. Your little girl can design her gift and interchange her charms to her heart's desire. Each bead and charm tells the story of everything that makes her who she is and everything you love about her. Presented in gorgeous gift wrapping with a certificate of authenticity, you can be assured that just like that fluffy pink tutu, she will love to wear this every day! 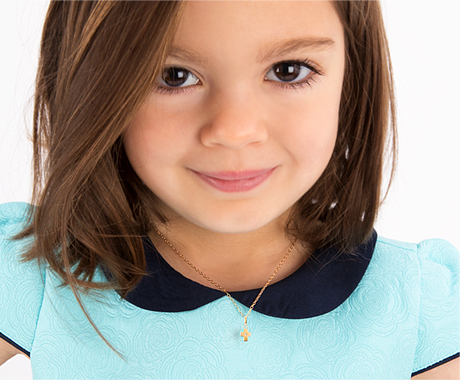 Exclusive Designs & Sizes, a Custom Collection made just for children.